Chinese New Year, commonly referred to as the Lunar New Year or Spring Festival, is now one of the top 5 most celebrated festivals across the globe. Not only do the festivities take place in China but other East Asian and Southeast Asian countries too, including Korea, Japan and Thailand as well as in the numerous Chinatowns across the world. The celebrations have customs and traditions, many of which have continued for centuries to mark the occasion. The New Year’s Eve dinner is an integral part of the celebrations, often enjoyed at home rather than a restaurant. It’s a reunion, where family members come together specially for the occasion. Even if a family member is unable to attend, a place at the table is left empty to acknowledge their belonging within the family unit. Fish is often the preferred dish accompanied by dumplings, both of which identify with prosperity. Other popular dishes include spring rolls, noodles and nian gao, a rice cake dessert. The selection of remaining dishes is subjective to personal choice, with individuals bringing delicious foods to share with their loved ones. As with many a celebration, fireworks add a sense of excitement, and enhance the festive occasion. Both fireworks and firecrackers are an important custom, originally used to warn away any evil spirits, with their loud noise and bright lights. This stemmed from the myth of the wild beast Nian who, legend has it, would harm villagers. 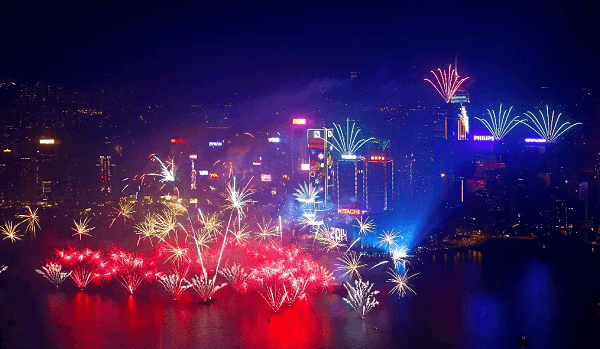 Despite their dark beginnings, fireworks are a tradition looked upon fondly by the Chinese. However, the setting off of firecrackers is far from spontaneous with a window of opportunity differing across the regions. 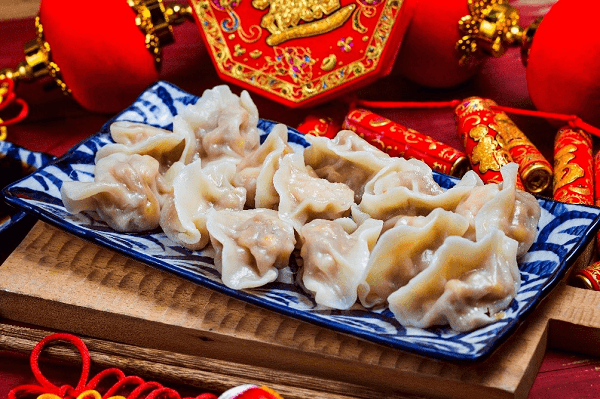 It is most common to set them off before New Years Eve dinner, at midnight on New Year’s Day, on New Year’s Day morning and once the celebrations have commenced during the lantern festival to welcome good fortune. Red envelopes are exchanged throughout the festivities, known as yasui qian. The colour red represents the weapon of defence, bringing luck and warning away any misfortune. Envelopes are gifted to parents, siblings, close friends and employees to name a few, as a way of sharing blessings. The amounts vary with parents typically receiving £80-£235 and children around £15. Whilst this is a generous custom, there are strict guidelines to follow, one being the red envelope should always be received with both hands. It is seen as discourteous and impolite to accept the envelope with just one hand. Coins should not be placed within the envelope, only crisp new bills. 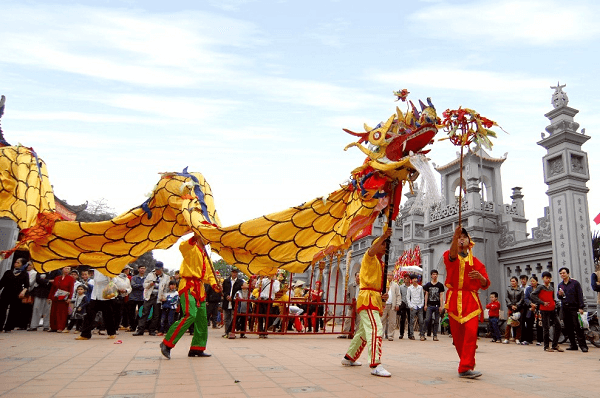 When we think of Chinese New Year, the colourful dragon parading the streets is a vision that comes to mind. It is an important part of the cultural festivities as Chinese people believe themselves to be descendants of the mythical creature. It is a tradition that on the 15th day of the New Year the streets are full of dancing dragons, which represent prosperity and good fortune in the New Year. Lion dances fill the towns, with their bright colours, charismatic faces, creating a sense of excitement and enhancing the festive atmosphere. The lion is seen as an optimistic creature that denotes bravery, determination and inventiveness. For this reason, the Chinese believe that those who engage in the performance will receive good luck in the New Year. Sadly, cleaning is a part of everyday life that we have no choice but to partake in. Similarly, to how we may have a thorough clean before Christmas and then the entire family arrives to celebrate the festivities, Chinese people embark on a ‘winter clean,’ known as “sweeping away the dust,” parting from the old year and welcoming the new. The cleaning must be completed before the first two days of the New Year, otherwise it is seen as sweeping away any good fortune accumulated by the litter of firecrackers, envelopes and any other items that harbour evidence of the celebrations. The Lantern Festival concludes the celebrations. Lanterns in an array of shapes are made from paper or silk and lit so they enter the night sky. Such traditions are unique to Chinese New Year, with Chinatowns across the world boasting their exciting cultural events. In the UK alone cities including London, Manchester and Birmingham partake in the occasion. For example, in London hundreds of thousands of people visit the West End to witness the stunning parade, with the main stage in Trafalgar Square. These events will be crowded, so if you want to celebrate in a more relaxed setting then why not enjoy a Chinese with your family and friends. These traditions have gone on for centuries, but why not make some of your own? Whatever you fancy, be part of the magical celebrations in a way that suits you best! Prices and information correct as at January 2019.